People | Social Innovation Weekend 2018 | Bright'em up! Saar Francken (mentor + keynote speaker) is a Social Innovation Consultant and Associate of the Cambridge Centre for Social Innovation. Her expertise lies in creating effective interaction between potential partners in order to develop innovative solutions for social issues. As social entrepreneur, she has launched several cultural and social initiatives. She shares her experience as mentor during Cambridge Social Venture Weekends. In 2018, she graduated with distinction from the Cambridge Centre for Social Innovation. Radek Hábl (mentor + keynote speaker) holds a master’s degree from the Prague University of Economics, Faculty of Accounting and Finance. His professional experience includes more than 11 years in the private sector, including 5 years with IBM, where he assumed increasingly senior finance roles. Radek is currently developing an evidence-based, holistic and systemic approach to transform the current unfair ecosystem of debt. He is encouraging close cooperation between key professionals to bring more than a million over-indebted and excluded Czech citizens back into society. He also lectures on financial literacy and assists with individual cases. Radek cooperates with the Agency for Social Inclusion and is author of the interactive Execution/Repossession mapand author of a strategic action plan for social inclusion to combat over-indebtedness. Since 2018, he has been a member of the Ashoka Fellows Network. Jakub Peřina (mentor + keynote speaker) is an IT enthusiast. He enjoys finding solutions for deaf people to obstacles and ideas in the IT industry. His dream is to develop and provide the deaf community with “deaf friendly” applications people would enjoy using. Currently, he works for the company Tiche Spojeni, whose mission is providing cloud services with online sign language interpreting or written transcription to allow deaf/hard of hearing people to call anyone they need at any time. Tomáš Studeník (mentor and host) is radical innovator and strategist with over 15 years of experience in marketing. Tomáš holds MBA from University of Liverpool and continues with post-gradual studies of innovation at HEC Paris. 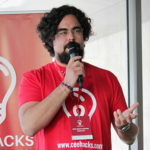 Tomáš organized first global CEE Hacks hackathon in 2017. Apart from consulting companies on innovation strategy, Tomáš holds monthly FuckUp Nights where lessons from failure are publicly shared by distinguished entrepreneurs, scientists and artists. Melinda Varfi (mentor and judge) believes in the power of communities and is passionate about helping them grow in order to contribute towards a sustainable society. Having worked in different sectors, including education and trade development, she has found that the closest matter to her heart is sustainability. She co-founded Impact Hub Budapest and is a member of SocialFokus in Hungary. She enjoys engaging with people in meaningful conversations about their environment and helping them recognize their own true power to make steps towards a more sustainable world. In the last 5 years, she has been facilitating and designing these dialogues and processes. Iva Kovandová (mentor) during her legal studies at the London School of Economics realised that her dream career would be in the Czech civil service, so she joined the social innovation unit at the Ministry of Labour and Social Affairs and has never looked back since. Her main area of work is consulting for project drafts, where she focuses on solid theory of change, knowledge of root causes of problems and systemic solutions, and in preparing new calls for proposals and keeping up with new trends in the social innovation domain. Her main interests lie in behavioural economics, public sector innovation and mental health projects. Štěpán Rezek (mentor) holds a degree in sociology and public and social policy from Charles University. He is currently working in the unit for social innovation and international cooperation at the ESF implementation department of the Ministry of Labour and Social Affairs and has participated in the creation of calls for innovative proposals in the current programming period of the Employment operational programme. His main area of work is consulting and supervising evaluation documents in project proposals as well as running projects. He is chiefly interested in projects dealing with issues of local government and health. Jan Veselý (mentor) coordinates the Alliance for YOUth in the Czech Republic (more than 50 companies helping young people find their place in the world of work). He has developed several accelerating programmes for social innovation (such as the Vodafone Foundation Laboratory). Currently, he teaches at Charles University and leads the Innovation Laboratory at the Hybernská Campus. He also founded EduFórum (meetings for innovators in education) and is a member of Red Button’s business ecosystem and co-founder of Changemakers Czech Republic. Veronika Mahdalová (mentor) holds, among other things, a degree from the Technical University of Ostrava, Mining Faculty. But she decided not to pursue this career path. After an internship in the Philippines, she joined the Prague “company builder” Creative Dock, preparing EU educational and structural funds and working in the automotive industry. As a project manager, she led the Elektra Cars start-up and CUBIQ, a service providing simple personal belongings insurance. Now with the online community publishing platform Pointa, she has moved into the literary field as a project CEO. Tereza Štolbová (facilitator) is an enthusiastic (service) designer. She studied graphic design and service design at Aberdeen and Dundee universities in Scotland and went on to work at several design research and innovation companies in London, Amsterdam and Prague. She has been working (read: playing) at IdeaSense for the past four years. Her heart is set on making people’s lives easier. Tereza is fascinated by the human ability to “hack” virtually anything and create interesting DIY innovations. She believes that real progress can only be achieved if it is based on deeply rooted human needs and through tireless trial and error. Tereza loves to fail, especially in front of an audience during improv shows. She recently became a mother, which has only made her crazier! Eliška Skarolková (facilitator) is a formal industrial designer. Her work has taken her all around the world and made her realize that she does not want to spend her life designing products which are beautiful but have no added value to people. She has finished Design for Sustainability at the Savannah College of Art and Design and redirected her focus towards social innovation and designing sustainable services. She has been recognized for several projects in social and environmental sustainability, which include improving the life of smallholder farmers in Nigeria or utilizing food waste from restaurants in the USA. Eliška is currently writing a research paper on how art and design practice can help empower low-income communities and will be presenting it at the Fifteenth International Conference on Sustainability in Vancouver. She loves reading sci-fi and believes that everything the human mind can imagine is only a step away from becoming reality. Ondřej Kácha (facilitator) graduated in Psychology and is currently a behavioural scientist at IdeaSense. His work focuses on applying insight from behavioural science to increase people’s prosocial behaviour. Some of his studies were spent at Groningen and Cambridge, where Ondřej was engaged in a number of international projects. In 2015–2016, he coordinated a junior research programme for European psychology students and co-founded PsyHub, a platform for psychology students across the Czech Republic. Since his time in Groningen, he has developed a peculiar relationship to outdoor races which flood his life with a lot of mud and rain. Petra Koudelková (mentor) is an Assistant Professor at Charles University, Faculty of Social Sciences, Department of Marketing Communication and PR. She focuses on marketing for small and medium-sized enterprises, especially social enterprises. She was a member of the team which created the CSR Index for non-profit organizations, citizens and companies and participates annually as a member of the commission in evaluating the top responsible company of the year (Top odpovědná firma roku). She is also the author of many articles on marketing and marketing communication in SMEs and SEs. Petra Dzurovčinová (mentor and judge) is currently CEO at Freya Care and helps companies with business development, marketing strategies and innovation endeavours. Her start-up Freya gives women more freedom to choose when and how to have children by helping them live life on their own terms. She worked as the founding Executive Manager at the Slovak Alliance for Innovation Economy (SAPIE) after returning from Australia. Petra places innovation and learning at the core of everything she does all the time. Aga Osytek (mentor) is the founder of the unique research and marketing agency Deaf Respect – Agency of the Deaf, which brings the voice of deaf people to the market. The agency collaborates with other creative agencies, customer services and new technology creators. They help eliminate stereotypes about the Deaf and turn good intentions into good effects. In 2013–2016, she successfully created the brand Migam. She also supports other entrepreneurs in: social mission management, social impact development, communication, brand awareness and organizational culture. Natalia Križanová (mentor) is a Manager at the Deloitte Public & Social Impact Consulting Practice in Prague. She has been working in government and social sectors in the Czech Republic and Australia for the past eight years. She is passionate about building ecosystems to deliver the best outcomes for the most vulnerable communities as well as supporting public and not-for-profit organisations in creating social innovations, developing strategies, improving operations and delivering better services. Veronika Pistyur (mentor) is a brand strategist, startup mentor and ecosystem builder and CEO of the non-profit association Bridge Budapest. Previously, she was mentor at Kitchen Budapest, Design Terminal’s Techlab and the Hungarian Templeton Program and top mentor at Telenor Accelerate Program. In 2016, she won Female Role Model of the Year in the Central European Startup Awards. With an educational background in directing for television (DLA), visual and cultural anthropology and international relations, she has produced television programmes, managed a communication agency and worked in marketing. Linus Onyango Omondi (mentor) is the Immediate Past Chairperson of the UNESCO Youth Forum of Kenya. He is the African Representative to UNESCO and a Unesco Youth Peace Ambassador. He is also the current Executive Director of the Kenia Voluntary Service Organization, an organization devoted to environmental conservation and limiting wildlife poaching as well as being involved in youth exchanges. He is also in charge of start-up weekend East Africa, which is held every year in Kenya and Tanzania, and holds the distinction of Commonwealth Associate Fellow. Linus has worked in Poland as a PR expert and has continued to spread the message of peace and togetherness by mentoring over 1000 young people in Africa and Europe. Linus considers himself a citizen of the world. Katalin Ertsey (mentor) worked in executive and consultant roles for 15 years at various international NGOs, then moved on to the corporate sector, where she advises clients in business ethics, CSR and diversity issues. In 2010, she was elected to parliament for the Greens and served as an MP for four years. She started her foreign service in Prague in 2016 and works in science, innovation and startups. She organized the first V4 Women’s Startup Workshop & Networking Day for social impact startups with Impact Hub Prague in May. She recently participated in a women’s business mission to Israel to study innovation and startup ecosystems. Katalin uses her skills and diverse experience in non-profit, corporate and government sectors to mentor and provide strategic consultancy pro bono to the local business community, especially women. Jana Merunková (mentor) is an experienced businessperson and expert in interactive commerce, a coach and a changemaker in education and integration policy. In 2010, she co-founded the yourchance NGO. She studied journalism, business coaching and pedagogy. In the last five years she has been a member of the working group “Entrepreneurship and Economics” at the Ministry of Education, Youth and Sports and National Institute for Education and has been involved in other expert teams as a founder, consultant or team leader. Since 2001, she has been active in fundraising. Her hobby is writing poetry and fairy-tales. She has received several awards for her work, including “Prague 7’s Businessperson of the Year 2004”, the T-Soft Eternity 2011 Annual Award for a project on teaching financial literacy to children in orphanages, yourchance in TOP 5 NGOs of the Year 2014 for yourchance. Ricardo Monagas (mentor) is a software engineer who helps startup founders in website UI/UX design & development, web apps and mobile apps. Currently, he is helping European social businesses through his digital agency Uppersky. One of his customers is Pragulic.cz -which is one of the most successful social organizations in the Czech Republic. Damian Rzeźniczak (mentor) proudly represents the deaf and is from a deaf family and a native user of Polish Sign Language. He is very aware that the deaf community can achieve much for mutual understanding by providing the right solutions for deaf people. He was a member of the Polish Deaf Association team in Łódź, Poland for two years. He has nine years of experience as a lecturer. He is the author of several textbooks and learning materials on Polish Sign Language for children, young people and adults. He is currently CEO of the Polish Sign Language Centre (CPJM), a company dedicated to promoting Polish Sign Language and its values, where he is helping improve education in Polish Sign Language. CPJM also builds social awareness about deaf persons and provides information about their needs. He has a great thirst for knowledge of the world and loves reading, travelling and learning as much as he can. Barbara Halířová (mentor) has been working since 2009 at the People in Need humanitarian aid organization, starting as a career counsellor and coordinator for educating children and youth. As a part of these activities, she has also been involved in educating children at primary and secondary schools, focusing on financial and debt literacy. She worked in the field for People in Need, and now also has 5 years’ experience as a professional social worker and debt advisor. Barbara was a primary lecturer for Semiramis z.ú., and since 2016, she has been working as a local expert on debt and social services at the Agency for Social Inclusion. Vlado Vaculík (mentor) founded one of the first co-working spaces in Bratislava in 2011. In more than five years of operation, Connect has helped hundreds of startups, entrepreneurs and freelancers to start and grow their businesses. By hosting more than 2000 participants every year at its events, the company has become one of the largest business education platforms in Slovakia. One of our latest projects is Lab.cafe, a co-working and co-making cafe in Bratislava’s central business district which offers space for work and machines for creating. By providing prototyping and design services, Lab.cafe creates an ecosystem for new design brands, IoT creators, makers and thinkers.